MISSION, BC – Mission Springs Brewing has released a new seasonal beer, and has also hinted at plans for another new addition to the line-up. 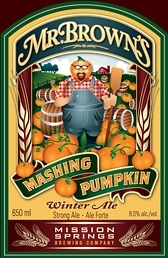 The newly offered beer is Mr. Brown’s Mashing Pumpkin, a “full-bodied, spice infused Winter Ale” that checks at at 8.0% abv. It’s available now on tap at the brewpub, as well as in bottles in the adjoining liquor store. Next up from Mission Springs will be Strong Man Ale, a “Cascadian Dark Ale” due out January 30th. Not much has been announced about this beer yet, but a recent tweet includes a label image as well as a sales contact. More details will be announced here in CBN as they become available.